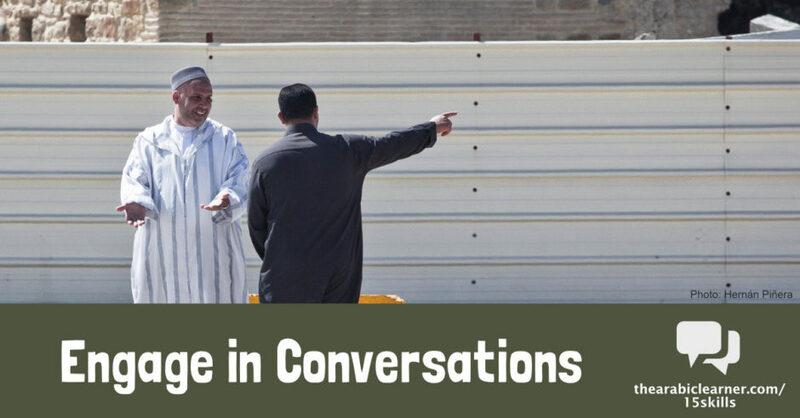 In this post I am going to highlight five things that can block us from participating in Arabic conversation, and offer five ways that I have found helpful to increase meaningful, conversational interaction. You might be facing fear when it comes to engaging in Arabic conversation. Fear can affect us in unexpected ways, and speaking in a language that is not our own can evoke fears that we did not expect. Often when we are affected by fear we don’t even fully realize it, and we give it other names. Arabic conversation requires interacting with people, and people can be one of our greatest sources of fear. Bungee jumping or driving in Cairo, two somewhat dangerous activities that I enjoy, cause less fear than what is stirred up inside me by the prospect of having to interact with certain people! You might fear that your time will be drained by getting sucked into long conversations with people that you would rather not have conversations with. You may fear that conversations could open you up to relationships that you are not interested in, or people who want you to be their lifelong friend and language partner. Conversation can sometimes make you vulnerable to people wanting relational commitment (I don’t primarily mean the romantic kind, although that can happen too). Not all of those fears are unjustified. Time and relationship are two of the “risks” of conversations. But don’t let them stop you from conversing. Instead, just learn how to set appropriate boundaries that are comfortable for you. Self-consciousness is the enemy of language learners. It is one of the greatest problems that successful Arabic learners need to overcome, and one of the things that can keep us from engaging in Arabic conversation even when we have plenty of opportunities. It is easy to feel self-conscious about making mistakes in our language. This is one reason why learners often feel that they can speak easily in Arabic with their teachers, but once they get out “on the street” their level of skill seems to drop. This is usually due to the negative emotional filter that self-consciousness can create in us. Self-consciousness can also extend to a preoccupation with not making cultural mistakes. If you are operating in a situation where you feel that you are the cultural outsider, you may find it harder to put yourself out there and engage in real conversations. Always remind yourself that there is no shame in being a learner. No shame in trying and making mistakes. Having a growth mindset is something I have written about before, and it is the foundation to being a great learner. Many of us find it hard to come up with the time needed for Arabic conversation. Conversations take time. Conversations in a second language tend to take even more time, because the interaction often requires increased clarification and repetition. And so in the end, your ability to engage in conversations is greatly affected by your willingness to make schedule changes that will facilitate talking. In my first year of intensive Arabic study when I arrived in Egypt, I would spend five hours/day in class, usually followed by 3 hours/day of homework. Once that was finished, I made a habit of spending 2 hours/day sitting on the street and talking with people who spoke Arabic. My local fruit seller and I had a good friendship, and through him I met many others. That left me with very little time for other things, but it was a worthwhile investment due to the way it allowed me to make rapid progress in my Arabic. Inertia is the tendency of objects to stay in their present state of motion. If a car is not moving, it takes a very strong push to get it moving, whereas if it is already rolling it is much easier to keep it moving forward with smaller pushes. It’s the same way in our lives when it comes to things that require effort. We often lack the will to push and get them in motion. Sometimes when you want to engage in Arabic conversation, the problem is that you don’t really have enough drive to overcome the inertia of not taking action. This can be particularly true for me when I am tired, working on too many things, or feeling introverted (tests usually put me close to the line between being an extrovert and an introvert, slightly more toward extroverted but not very far). The solution is not really mind-blowing, but it is sometimes incredibly hard to do. Make the effort. Get up off of your seat and put yourself into places where you will converse. Break the inertia! Most of us do not believe ourselves to be prejudiced. But sometimes the subtle prejudices that we don’t realize we have may get in the way of engaging in useful Arabic conversation. If you are interested in learning Arabic, you probably aren’t going into it with an intentional prejudice against Arabic speakers. Unfortunately, sometimes negative attitudes grow without us realizing. I have watched some Arabic learners become jaded through negative experiences they have while living in an Arab country, and actually begin to dislike the people whose language they are trying to learn. Needless to say, motivation to engage in conversation wanes significantly when you are developing a negative attitude toward the speakers of that language. If you are struggling with this, then take time to think through your negative experience objectively. Don’t allow it to form an irrational prejudice in you against an entire group of people, based on the actions of an individual or small group. Other types of prejudice can also come into play. While having my above-mentioned daily conversations with the street vendors in my first year, I was approached by another person living in my apartment building telling me that I should avoid sitting with the vendors because their socioeconomic level makes them untrustworthy. That was one piece of advice I did not take, and I am thankful I didn’t. Most prejudices we need to deal with are our own, and we are responsible to fix them. However, sometimes other people’s prejudices can affect us. I am seeing more and more instances these days where other people’s prejudice and ignorance can actually make Arabic conversation hazardous. In the past few months, a number of Arabic speakers have been treated in ways that are shockingly ignorant on airlines in the US (for example, speaking on the phone in Arabic, or using the word “God” in Arabic). Refusing to allow people to fly because they are speaking in Arabic is both ignorant and wrong. As an Arabic learner, know that you may face similar situations and be ready to challenge the ignorance behind them. If you are looking for Arabic conversation with native speakers, go to where the native speakers are. This may sound too basic, but sometimes the simple solutions are the ones that are overlooked. Whatever level of exposure or access you have to people who speak Arabic, consider what you can intentionally do to take it up a level. If you live outside of the Arab world, try to find places within your area where you can be with native speakers. In the past this was not a very practical option to mention, but in recent years the influx of refugees and immigrants has made this a practical option in many parts of the world. If you can’t make connections in person, consider using online options for conversation partners, such as Wespeke, ConversationExchange, MyLanguageExchange, italki, etc. If you live inside the Arab world, assess whether the current place where you live gives you regular access to Arabic conversation. In many Arab countries, places where expatriates typically live often do not require much interaction in Arabic, for everyday life. If you really want to find people to talk with in Arabic, consider moving to a place where English or other non-Arabic languages are not understood. A second way to increase Arabic conversation is simply to be more friendly with Arabic speakers. This is not rocket science. It is recognizing one of the basic principles of human interaction, that people tend to be more open with people that are friendly and like them. It’s a simple equation. Smile and be friendly, and you will find more people willing to talk with you. If you do this in the midst of people that are native Arabic speakers, you will find yourself engaging in more Arabic conversations. One predominant cultural trait in many Arab countries is that people are friendly, and enjoy talking with each other. Take advantage of this, and don’t be shy. 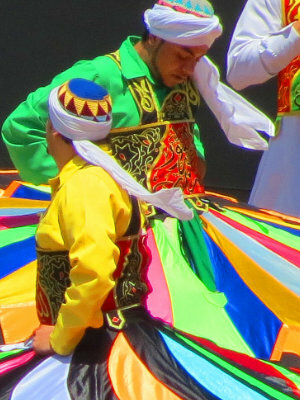 Do bear in mind that breaking cultural norms for social interaction between genders (and that varies from country to country and setting to setting) will probably not help you find the mutually beneficial Arabic conversations you are looking for. If you live outside of the Arab world, the principle of being friendly is the same. In some places where Arabic speakers have had to face prejudice or a cool welcome, your friendliness will be a refreshing change for them. Another way to find good Arabic conversation is to get involved in interests and activities that you share with Arabic speakers. An online language exchange can be a helpful place, but the most successful exchanges are the ones where the two speakers share a common interest. If you live close to native Arabic speakers, try to think of places where you might be able to engage in some kind of activity with them, be it recreational, religious, charity-related, or educational. Related to this is the idea of putting yourself in places of forced neediness – where you need help from Arabic speakers in order to accomplish something. This often works best inside the Arab world, when you are an outsider who needs help in the daily tasks of life. Asking people for help in getting to a destination, finding something you need to buy, or fixing something can all be a great way to engage in Arabic conversation. People tend to be self-focused. This affects our conversations. We like to talk about ourselves, whereas in other people do not always find that very interesting. If you want to engage in stimulating, educational, and enjoyable Arabic conversation, ask people lots of questions about themselves. As a part of your learning strategy, find out how to ask questions early on in your language acquisition, and then ask people as many questions as it takes to get them talking. Try to keep the conversation focused on them, not you. Ask questions, listen to the answers, and ask more questions. This is an excellent way to spark interaction. It also makes you more engaging and interesting as a person, in any language. 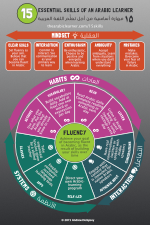 A fifth way to increase your Arabic conversation is to work on building your Arabic language skills. The more you increase your vocabulary, practice your pronunciation, study grammatical structures, and practice listening, the more useful and engaging your conversations will be. The relationship between language skills and good conversations is one of mutual interdependence. Good conversations in Arabic improve your Arabic skills. Improving your Arabic skills leads to more and better conversations. Keep both of these areas in focus, and you will find your Arabic advancing at high speed. There are many other barriers and helps to conversation that could be talked about, but these are the ones I have found to be most prevalent and most helpful. The most important thing is to bear in mind what my Arabic teacher Abbas Al-Tonsi said to me: “Talk with Arabic speakers. 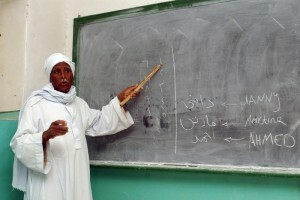 It must be verbal communication to keep the Arabic at the desired level of proficiency”. Avoid the barriers. Jump into conversations. You’ll find your Arabic growing quickly if you do this. Personal interview with Abbas Al-Tonsi, May 1, 2015.